Collection elements are on Dave’s mind as he takes notes from Becky Klein. Becky is the tool room specialist at Office Smart’s Naperville plant. Dave Cromwell is the Quality Lead at OSS. He is interested in listing the parameters and dimensions that are used at the Naperville plant. Becky knows all about that. 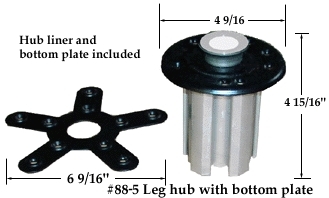 Dave and Becky are discussing the Linear Hub. This item has three main parameters that come under inspection. Height and Diameter have numerical values. Finish is measured in grades. Dave sets up Height as shown below. Whatever Dave enters in the Prompt field will appear in the column heading for the given element when quality results are entered. As we see above, the moment we enter the element name and tab out of the field, the same value defaults in the Prompt field. This value can be overwritten. 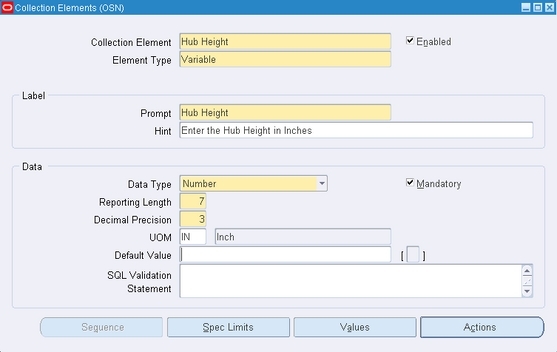 Dave wants the user to be aware that the data to be entered in the Hub Height column during quality results entry has to be entered in inches. Dave enters an appropriate message in the Hint field. The user will see this message at the bottom of the screen during quality data collection. Also, because Hub Height is a Variable type element, Dave sets the Data Type to be Numeric. Dave sets up Hub Diameter in much the same way. But for the element – Hub Finish, Dave has to enter a set of non-numeric values. 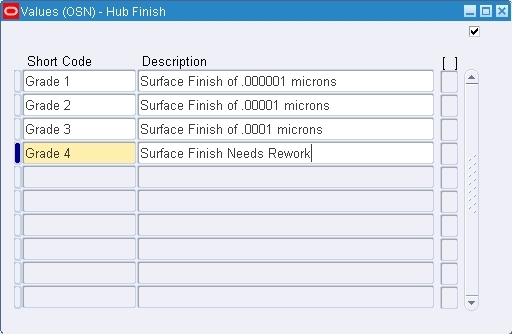 This is because Hub Finish is an Attribute type element. The values he enters carry descriptions as shown below. Dave would create elements for quality data collection for other items at OSS in a similar manner in consultation with Becky.